Swisher Sweets Mini Island Bash Cigarillo Cigars Buy 1 Get 1 Free 120 cigars is one of the smoothest smoking experiences you will ever enjoy. 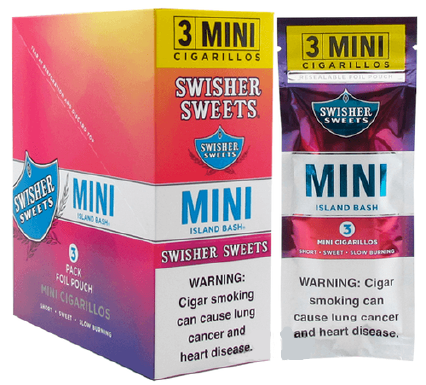 Swisher Sweets Mini Island Bash Cigarillo Cigars Buy 1 Get 1 Free 120 cigars has long strived to make their brand accessible to all cigar enthusiasts, and the Swisher line of cigars does just that. At modest prices, Swisher Sweets Mini Island Bash Cigarillo Cigars Buy 1 Get 1 Free 120 cigars appeal to those who don't want to spend extravagantly to enjoy their daily smokes. Available in swisher sweets tipped, swisher sweets flavored, swisher sweets cigarillos and more.